We’ll know on Monday who Bob Bradley picks for the US National team for this summer’s Gold Cup and for the upcoming friendly against Spain. I figured today would be as good of a day as ever to throw out my 23-man roster that I think Bradley could select come Monday. As we know this is a big Gold Cup for the US as they’ll want to get the crown back from Mexico in hopes to qualify for the 2013 Confederations Cup in Brazil. The first two are locks in my mind while Rimando would easily be beaten out by a younger keeper that Bradley wants to give some experience to for the training camps and what not. We know Howard is the starter no matter what here so this area is really the easiest to pick I would think. David Yelldell could see his name called as he saw time with the US against Paraguay earlier this year. Another group that seems fairly easy to figure out. I know Bornstein hasn’t played a lot in Mexico but you know there is a familiarity factor between him and Bradley. Believe me I hate even the thought of him in the mix here but it will likely happen since he is still one of Bradley’s guys. Lichaj was a toss up for me as I think Zak Whitebread could be a good idea for a call-up too. Chandler can also slide into the midfield if needed here too which makes me a lock for me. I would like to see someone like FC Dallas defender George John get a look for this roster but I’m sure Ream will have beaten him out even though Ream has looked shaky at times this season for New York. The big question for me comes down to Onyewu. He hasn’t played well since his injury in 2009 in a US kit and really he hasn’t played a lot of minutes since joining AC Milan. But like Bornstein, Bradley sees him as one of his guys and that’s why he falls into this camp. 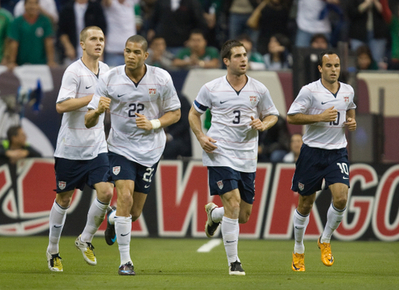 A tough group to predict outside the obvious (Dempsey, Donovan, Bradley, Edu and Jones). I think Feilhaber is an easy pick, but Diskerud and Bedoya are toss-ups for me. I could easily see Bradley take a chance on Sacha Kljestan here over Diskerud and someone like Brek Shea over Bedoya. I’d love to see Shea here but his lack of big international experience hurts him here I think for such an important tournament. I know his explosiveness off the bench would be great to have but given how well Diskerud does with the forwards that will be taken, its hard to pass up on chemistry for a risky move like Shea. I don’t think this one needs any explanation. Altidore is a lock while Agudelo and Bunbury have formed quite a bond together with the US. Charlie Davies saw his chances go away last weekend when Bradley was in D.C. to watch him and United play Colorado. His chance fluttered away quickly when he went out of the game early with an injury. I see no reason to even consider Eddie Johnson, Edson Buddle or even Herculez Gomez here. I’d say Gomez is really the only other player that could have a chance here to make the roster but it would be an outside one at best. Don't get me wrong, Goodson should definitely be included but knowing Bradley he'll have Bornstein in there. Altidore, Agudelo, and Bunbury get me excited for the future, man.